The Airborne Icing Tanker is a modified KC-135R Statotanker aircraft, that simulates rain and ice allowing the military to determine the effects of icing and rain on aircraft. 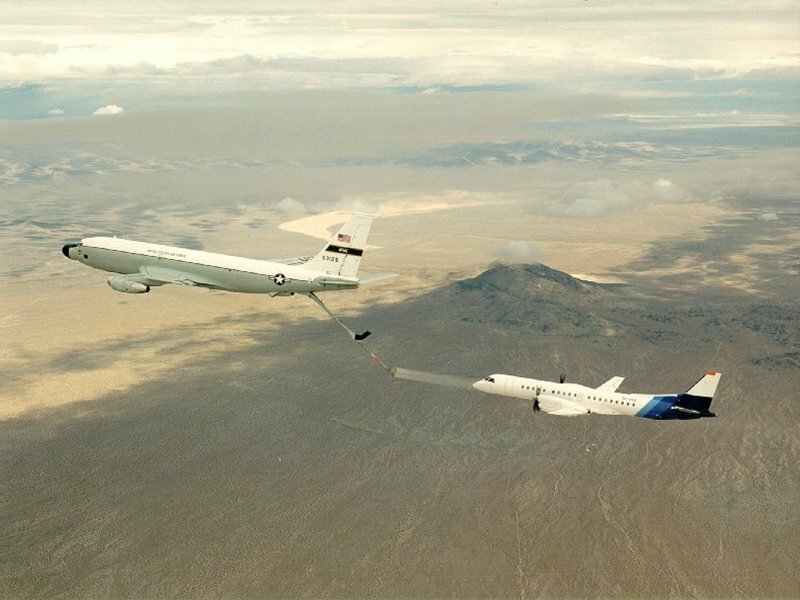 Such an aircraft allows testing to occur at Edwards Air Force Base rather than having to deploy other locations throughout the world to simulate the effects on test aircraft. The Air Forces only AIT recently returned from BAS Systems in Mojave, Calif., after receiving modifications to its navigation system that will bring it in line with operational KC-135 aircraft. The PACER Compass, Radar and Global Positioning System upgrade modernizes a portion of the KC-135 mission avionics and increases the navigation and flight management capabilities of the aircraft. The $12 million AIT program, which began in February 1999, will reinstitute an environmental test capability to simulate airborne rain and ice conditions under controlled conditions. The AIT system is expected to be operational by October, and will be ready to conduct ice-spray testing on a number of DOD aircraft, as well as Federal Aviation Administration certification testing on commercial aircraft. While the base here has lead responsibilities for the project, the Army is participating by providing system and user requirements and the Navy is heading up a team to design and build the spray array system. The Air Force is responsible for the instrumentation, water, boom and bleed air systems, as well as integration of all of the components onto the airframe. The 412th Logistics Group instrumentation division here designed the on-aircraft system and will install it on the aircraft in anticipation of systems flight-test this summer. Airborne icing testing is not new to the Air Force Flight Test Center here. Previously, the one-of-a-kind capability was installed on a KC-135A, which was retired in May 1996, because of the inability to generate enough revenue as a single-use aircraft.